Thailand’s royally appointed Election Commission on Monday formally blocked Princess Ubolratana Rajakanya’s prime ministerial bid, days after her brother King Maha Vajiralongkorn issued a rare order denouncing his sister’s unprecedented foray into politics. ENVIRONMENT Minister General Surasak Kanchanarat yesterday dismissed fresh calls from some forest community representatives for the utilisation of pristine forests in the latest forestland survey and demarcation, arguing that possible changes in the modest way of living of forest dwellers could affect the forest ecosystem. Officials are adopting a mixed approach to help deal with the toxic haze that has shrouded parts of the province, as local residents continue to ignore the ban on the outdoor burning of waste. Deputy Prime Minister Gen Prawit Wongsuwan this morning dismissed a rumour in the social media of a possible military coup against the Prayut government. The Nation Concern grows as the air pollution problem in the North and North-east regions of Thailand threatens to affect the health of the public. The Public Health Ministry will provide 10 key pieces of information for quality family creation via the Quality of Love: Phro Rak Jeung Yakhai Roo (We love you, we want you to know) QR Code, from Valentine’s Day on Thursday on wards. Education Minister Teerakiat Jareonsettasin asked the Office of the Basic Education Commission (OBEC) to improve the standards of English teaching and learning in Thai schools. The Minister of Interior has urged local administrations to make preparations for the coronation ceremony and to ensure peace and order during the election. Listed property companies plan to invest more than Bt100 billion in land purchases this year for the development of condominiums and low-rise residential projects in Bangkok and the provinces. The Department of Industrial Promotion (DIP) has accelerated the development of creative industrial village projects to promote 215 new tourist destinations in 77 provinces across the country. A 41-year-old police captain was arrested and then sacked for theft from a colleague’s car and from police headquarters in Bangkok on Saturday morning. Former Prime Minister Gen. Chavalit Yongchaiyudh has suggested an interim government be formed before the general election is held. Thailand is making a remarkable move to stimulate big investments in technology-advanced targeted industries that will drive economic transformation and support investors’ success. Police were looking Monday morning for whoever was behind a forged Royal Gazette announcement that Army Chief Gen. Apirat Kongsompong and other armed forces leaders had been removed by the junta leader. Thailand-based virtual reality startup Infofed has received an undisclosed co-investment from Singapore venture capital fund KK Fund and Thai events marketing platform EventPop Shows. The development of two ‘friendship’ bridges along the Malaysia-Thailand border in the state will help to stimulate the economic growth for the two nations. 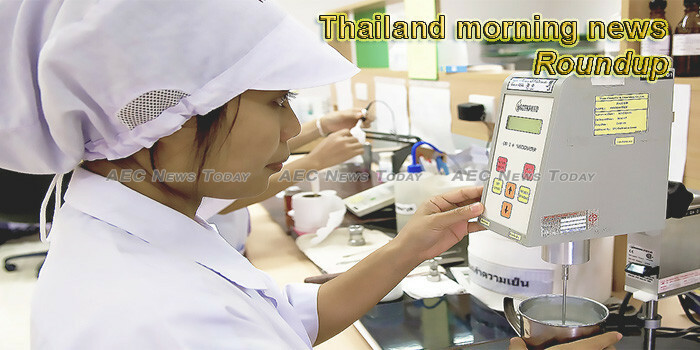 Dusit Poll reports that Thai people want better standards of living after the election. The Department of Foreign Trade (DFT) has organized the 2019 Agri Plus Award to support the use of technology to develop agricultural products. Growers of tobacco in Thailand, and those selling cigarettes and tobacco products, are feeling the pinch as illegal foreign cigarettes flood the local market. The attractions of Thailand’s southern border town usually become apparent after sunset On one side of the Thai/Malaysian border is Sungai Golok, on the Malaysian side it’s the town of Rantau Panjang. This week’s Thailand morning news feature photo acknowledges International Day of Women and Girls in Science, February 11.